CipherLab Connection | January 2019 - CipherLab Co., Ltd.
April 1960. With the need to improve working efficiency of inventory management in stores and warehouses, CipherLab has successfully cooperated with UK partner, Gane Data, to lead in different solutions for the enterprise since 2016.
doctors and home healthcare professionals to help ensure a successful home return for patients. 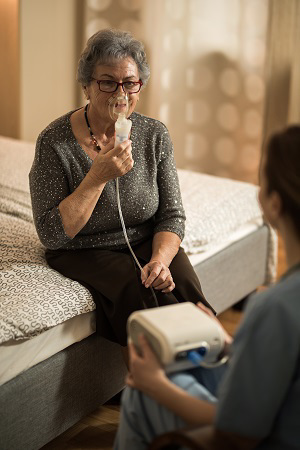 Their staff will visit patients in their homes for testing services to make sure the equipment’s optimal efficiency and condition for patients. To further maximize workers’ efficiency in the field, the enterprise is searching a new mobile device as optimal companion for the work. Our partner in Denmark is therefore approached and consulted. The enterprise adopts a simple off-line handheld terminal, which is out-of-date no matter in functionality or technology. Meanwhile, their existing backend system of customers and products is proprietary based. The purposes they would like to reach through the new solution include system compatibility and maximum practicability of on-line operations to streamline working flow. CipherLab RS31 is the new handheld terminal adopted due to its capability of running Microsoft Remote Desktop app (RDP), which perfectly bridges the workers and the backend system. 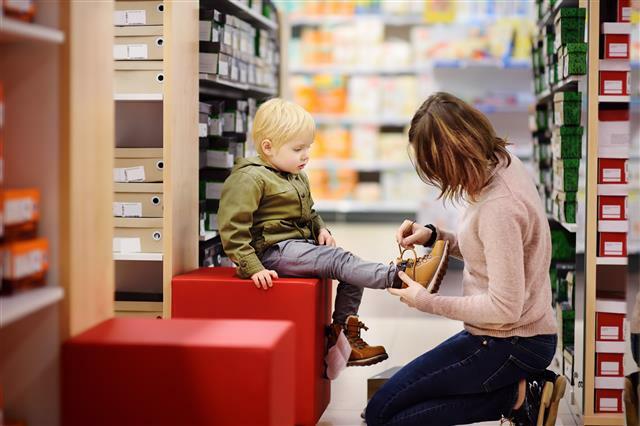 The new solution makes it easy for workers to complete online operations right on the spot, as well as to acquire guides and manuals when it’s necessary. The RS31 is a “business tool” designed with smartphone-like user behavior to deliver user friendly experience and raise user acceptance. Additionally, to fulfill enterprise’s requirements to a “business tool”, the RS31 also comes along with several free tools to expand its flexibility in customization. For example, App-Lock is used to create a clear user interface, in which only task-related apps will be shown on the screen, helping further enhance reliability for workers. To check out more product information about RS31 or other case sharing in the pages of CipherLab connection. barcode information showing on screen simultaneously. The action of “point device to the barcodes and then tilt the device back to check information” can be eliminated to make operation easier and save operation time for workers. 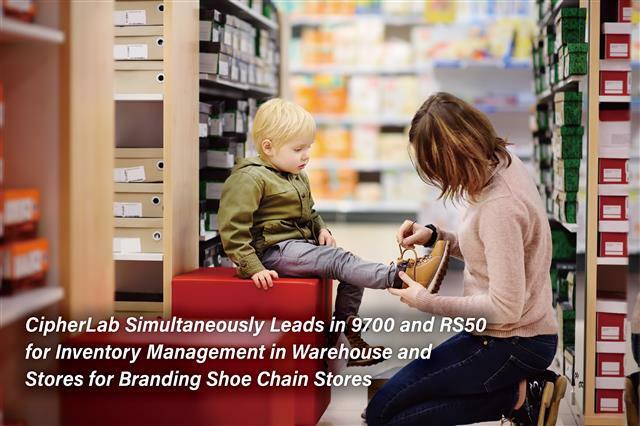 Accurate inventory and reducing operational costs by optimizing of journeys and locations of stocks are essential in today’s warehousing environments. Advanced technology and real-time traceability to meet logistics practices are also essential. 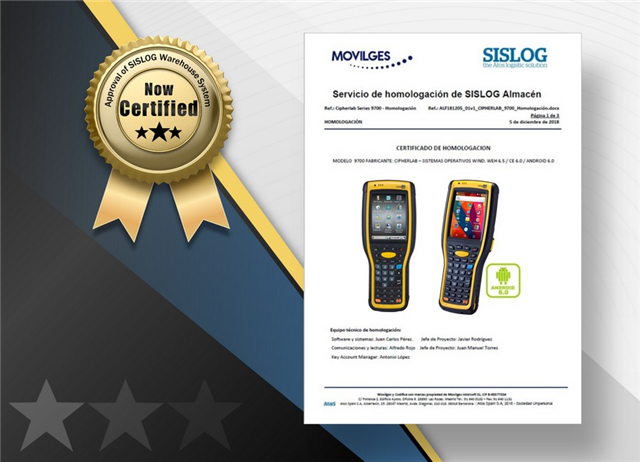 SISLOG is the leading Warehouse Management System software of Atos, covering the most market in warehouse sector in Spain. It is installed more than 400 warehouses more than 4 million m2. SISLOG integrates the most advanced technology and is a configurable and web-based modular system based on the client applications from inventory checking, stock movements, groupings, etc. 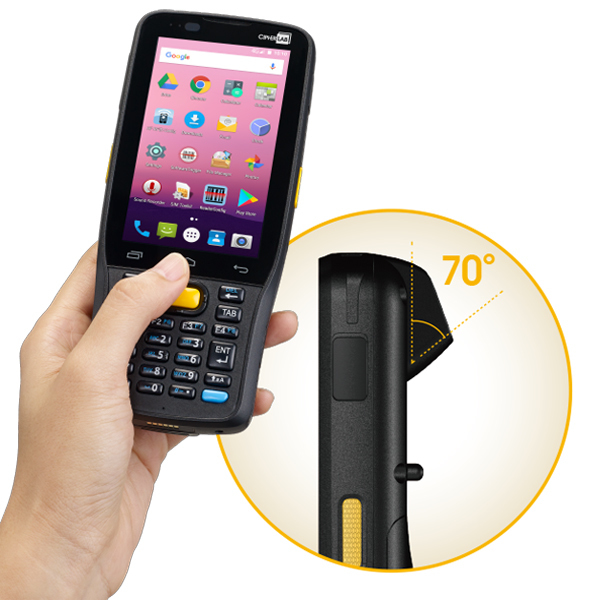 The CipherLab 9700 is specifically designed for applications in warehousing and logistics and is a best-in-class rugged handheld terminal. The integration of CipherLab 9700 and SISLOG WMS is the ultimate solution to deliver a productive warehouse management. The 9700’s scanning versatility enables quick and efficient barcode scanning captures for both long and short distance. Additionally, the 9700’s accessories such as pistol grip and 4-slot battery charger make operation easy in warehouses. longer distance reading demand and increase the application flexibility. The reading range of the mid-range imager is up to 4 meters which makes reading item barcodes on upper level shelves easier, eliminating the time for workers to climb up and down and increase efficiency. CipherLab RS31 series, the touch Android mobile computer is designed for the enterprises who are looking for a user-friendly “business tool” that meets a wide variety of needs for different types of industries and workers – from retail store associates, field service workers to healthcare staffs. It is designed for the enterprises that would like to adopt smartphone-like devices to the daily operation of customer-facing mobile workers. RS31 is a rugged smartphone that allows the users to have the benefits of smartphones without compromising the enterprise functionalities, such as durability, connectivity, and compatibility, to achieve peak productivity and efficiency. Weighing only at 260g, it is easy for users to carry around in the field. Its evolved specifications provide reliable WiFi and 4G/LTE connections, allowing accessibility to enterprise system anytime and anywhere. Now, in order to fulfill the longer range reading demand, the mid-range 2D imager is now available to help enterprises achieve a faster and smarter workflow. Check our website to learn more about RS31. problems. A new function is now available to further bring efficient app management. “Package Naming Rule” under App Management now lets enterprise or system integrator add Apps with same naming rule. For example, apps with ABC company’s App package name: .abc can automatically being added to the Allowed List by using this function. This may save time for administrators or system integrators to avoid adding these apps one by one manually and brings efficiency to app management. Aside from the newly launched function, here are the functions that you don’t want to miss. ”Auto Start App” which will bring workers to the designated App automatically after the device is turned on. ”Screen Pinning” will allow your mobile screen to be fixed, ensureing applications run without being closed and speed up the execution process. ”Clear Recent Apps” and “Recent Apps Whitelist” are two contrary setting concepts. “Clear Recent Apps” could be used to clear any Apps that are being accessed recently. On the contrary, administrators could set specific applications with boxes ticked in “Recent Apps Whitelist”, these Apps will be kept and not cleared when you clear recent Apps. Moreover, the function “Assist App” is like the iPhone Siri. It can be activated with a long press on the Home button. All the applications listed in the “Assist App” page of AppLock correspond to Android system settings. 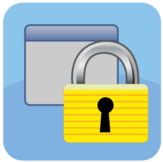 Use AppLock to your advantage; it will bring great help to your device management. Start to explore all these functions and you will find that AppLock is more powerful than you think. Contact CipherLab for further information. We collaborated with our local partner Koncept-L in 2018 RetailShow – Polish’s largest exhibition of equipment technology and services for retail. Throughout the prestigious competition, CipherLab RK25 series was awarded in the best in its category as the Retail Innovation of 2018. The RK25 will thrive in retail, as well in warehousing, T&L and manufacturing. 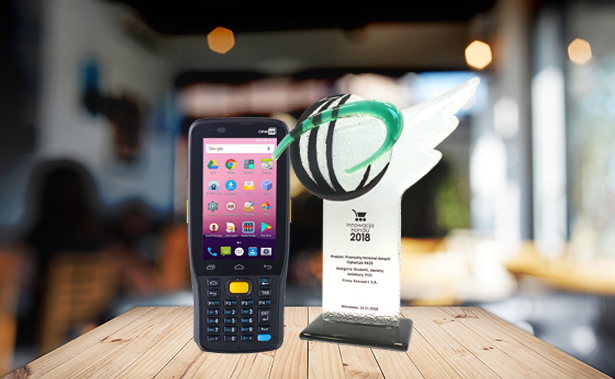 Winning this competition approves CipherLab RK25 is a great performer in Retail applications. 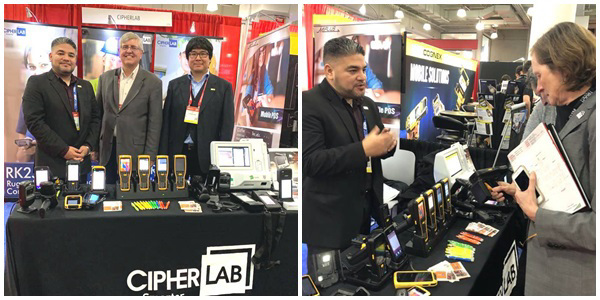 The CipherLab USA team had a great exhibition at NRF and good business communications with visitors. Our colleagues have met non-stop with retailers and brand owners from all over the world, discussing how CipherLab’s mobile devices, Mplus’ self-service POS and Mobile POS can transform their retail operations. Contents c 2019 CipherLab Co., Ltd. All rights reserved.